I hope you are enjoying the summer. This e-newsletter includes information on some upcoming events and other items of interest. 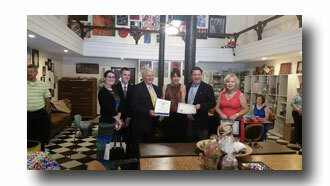 Senator Mensch attended the grand opening/ribbon cutting ceremony of the ART Z Community Arts Center in Quakertown with PA State Rep. Craig Staats, Naomi Naylor from Quakertown Alive!, Danielle Marino –an intern at his Red Hill office, and SAHS students Peter Kramme and Joel Miller who were “shadowing” him for the day. I am pleased to announce that I will be co-hosting a free outreach event for veterans and their families with Representative Justin Simmons on Wednesday, July 29, from 10 am to 3 pm at our joint district office in Red Hill which is located at 56 West Fourth Street, Floor 2, Red Hill, 18076. The office is located on the second floor of the Red Hill Borough building. Pennsylvania Department of Veterans Affairs Mobile Outreach Van which will be staffed by a trained and experienced service officer to assist veterans and their family members on obtaining eligible benefits, answering questions and assisting with completing veteran-related applications. Nancy J. Becker, Montgomery County Recorder of Deeds will be recording veterans’ discharges and issuing Veteran Photo ID cards that entitle veterans to a discount at over 400 Montgomery County businesses. Veterans must bring their DD-214 papers (discharge papers) and photo identification to receive the discount card. Staff will also be available to assist with questions on state-related issues as well as to search the Unclaimed Property Bureau database to locate potential unclaimed property listings. There is no registration for the event. If you have any questions, please call my office at 215-541-2388 or Representative Justin Simmons’ office at (215) 679-3152. I will be hosting another “Coffee with your Senator” event on September 17, 2015 from 8 a.m. to 9:30 a.m. at the Quakertown Borough Municipal Building (35 North 3rd Street, Quakertown, PA). I encourage you to join me at this event for coffee and a discussion on state-related matters. If you have any questions, please call 215-541-2388. 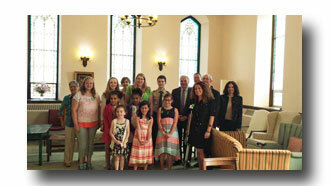 Senator Mensch appreciated the opportunity to meet constituents at the Arthritis Foundation Breakfast in Harrisburg. The General Assembly has taken a number of steps in recent years to help prevent child abuse and neglect, including passing new laws to require child abuse clearances and criminal background checks for anyone who is responsible for the welfare of a child. Unfortunately, this requirement created a financial burden on some of the volunteer organizations that provide special services and programs for young people. 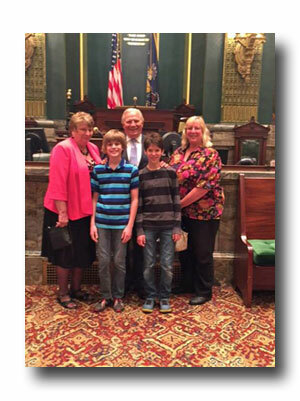 Governor Wolf recently agreed to waive child abuse clearance fees for volunteers effective July 25, 2015. In addition, the fee will be reduced for all other applicants from $10 to $8. The solution mirrors HB 1276, which was recently signed by the Governor and is now Act 15 of 2015. HB 1276 adds additional definitions to clarify who needs to obtain clearances for working or volunteering in programs that supervise children. The date by which volunteers are required to begin getting clearances is now August 25, 2015. Additional information about clearances required under the Child Protective Services Law are available at www.keepkidssafe.pa.gov. If you have additional questions, please do not hesitate to call my office at 215-541-2388 or contact me. The Property Tax/Rent Rebate program deadline for older adults and residents with disabilities to apply for rebates of rent and property taxes paid in 2014 has been extended from June 30 to Dec. 31, 2015. It costs nothing to apply for a rebate, and the department reminds residents that free application assistance is available at hundreds of locations across the state, including Department of Revenue district offices, local Area Agencies on Aging, senior centers and state legislators’ offices. Claimants who already applied for rebates may check the status of claims online at www.revenue.pa.gov or by calling, toll-free, 1-888-PATAXES. What makes a fair so special? It’s the community coming together, the entertainment and homemade food. It’s the best of show, field, woodshop, oven, garden, paintbrush, needle and thread. Whatever you’re looking for, you can find it in 109 different fairs across the state. Support your friends, your family, and your farmers. Support your fair. The Atlantic hurricane season is a time when most tropical cyclones are expected to develop across the northern Atlantic Ocean. It is currently defined as the time frame from June 1 through November 30, though in the past the season was defined as a shorter time frame. Hurricanes can cause catastrophic damage to coastlines and several hundred miles inland. A hurricane can produce winds exceeding 155 miles per hour as well as tornadoes and mircrobursts. Additionally, hurricanes can create storm surges along the coast and cause extensive damage from heavy rainfall. Floods and flying debris from the excessive winds are often the deadly and destructive results of these weather events. Slow moving hurricanes traveling into mountainous regions tend to produce especially heavy rain. Excessive rain can trigger landslides or mud slides. Flash flooding can occur due to intense rainfall. To prepare yourself for possible hurricanes and other natural disasters, visit www.readypa.org. Senator Mensch enjoyed hosting Dee Wiggins (right), her sister Gale Blase (left), her son Ryan (second from left) and his friend Alex Leonberg (second from right) during their visit and tour in Harrisburg. Automatic job recommendations based on individual preference. A dashboard that makes it easy to track and manage job applications. PA Career Coach, a career exploration tool with valuable employment data such as estimated earnings and local educational programs to help prepare for a specific occupation. The service is free to both job seekers and employers.